In this week’s installment of Tower Site of the Week, we continue to dig through our archives to catch up on some of the many fascinating studio and transmitter sites in the biggest radio market in America. This week, we move from New York City itself into the suburbs – Westchester County, just north of the big city, to be specific – as we visit a station that’s been the launching point for countless careers over a history that stretches back more than eighty years. 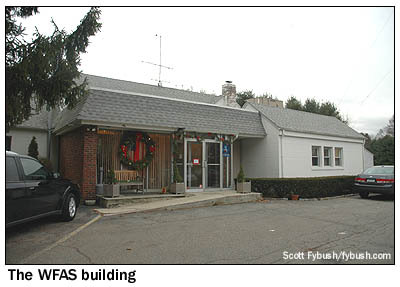 This is WFAS (1230 White Plains) and WFAS-FM (103.9 Bronxville), licensed to White Plains and operating from a site just off Secor Road in the town of Greenburgh. The history, first: WFAS(AM) dates back to 1932 under its current call letters, which stand for Frank A. Seitz, husband and father of station founders Selma Seitz and Frank Seitz Jr. But when they put WFAS on the air from the Roger Smith Hotel in downtown White Plains, the station already had a six-year legacy, most recently as WCOH in nearby Yonkers, and before that as Brooklyn-based WBRS, dating back to 1926. In its new White Plains home, WFAS was an immediate success, even though it wasn’t a full-time operation. First on 1210, then on 1240 after the NARBA frequency shifts of 1941, the 250-watt signal had to share its frequency with Long Island’s WGBB in Freeport. It wasn’t until March 27, 1943 that WFAS finally won full-time authorization by sliding down the dial one notch to 1230, where it’s been ever since. 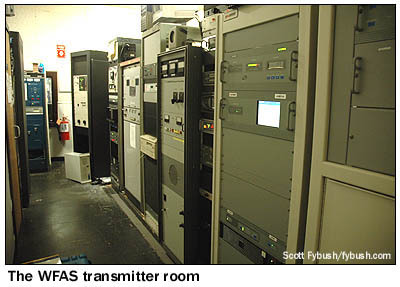 In 1947, WFAS traded its short tower on the roof of the Roger Smith Hotel for the present transmitter site in Greenburgh, building the small transmitter shack that survives today at one end of the current WFAS building. (Look carefully at the right side of the building to see the original structure.) 1947 also saw the debut of WFAS-FM, initially as a full-time simulcast of the AM signal. Seven years later, WFAS moved its studios from the Roger Smith out to the Secor Road site, building the first of what would be several additions to the original 1947 structure. 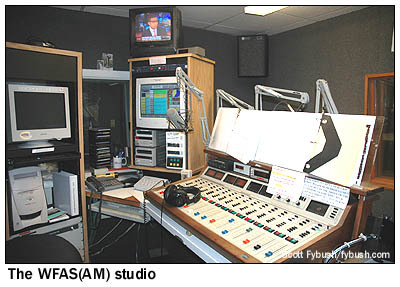 After several sales and format changes (including a few years in the late 70s and early 80s when the FM was known as WWYD), WFAS and WFAS-FM had settled into a period of stability when we dropped by in January 2008. From the lobby (decorated with the top beacon of the old self-supporting AM/FM tower that came down in 1985, replaced by the present 450-foot guyed tower), a window looks into a row of studios, one for the AM station (now playing soft AC, mostly automated outside a local morning show) and one for the FM (with live personalities all day long, playing a blend of workplace-friendly AC tunes). A large sales office faces the front of the property, overlooking Secor Road, while a newsroom and small news studio sit around the corner. At the back of the building, the original transmitter room now holds a motley array of new and old transmitters for AM and FM. The current main transmitters are a Harris for WFAS-FM and a BE for WFAS(AM). 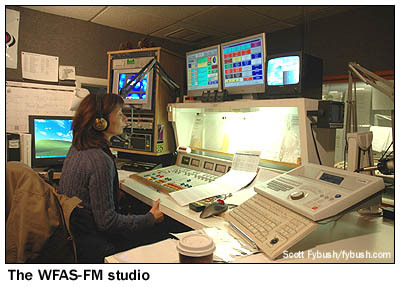 There’s also automation back here for WFAF (106.3 Mount Kisco), which simulcasts WFAS-FM for audiences in northern Westchester. There’s also a production studio tucked back here, in a room adjoining the transmitter room. And there are changes coming – Cumulus recently relicensed WFAS-FM to Bronxville, and it has a construction permit to move the FM signal south to the new WFUV site in the Bronx. Will that mean new studios, a new format, or even a sale to a new owner? 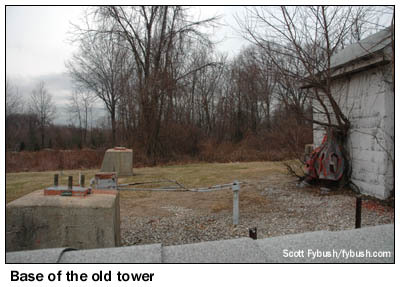 Only time will tell – but in the meantime, we’re glad to have had a look at all the history (including the concrete bases of the old tower out back) that mark this venerable Westchester transmitter and studio site. Thanks to WFAS CE Randy Shull for the tour! Happy Independence Day Scott. It was just a couple of years ago you came to visit on the 4th of July at my former job and we had a good time talking about the business then. Enjoy your holiday with your family! Sorry, totally hate the new call letters, WNBM. Another cool local site mostly eaten up by a giant, what a shame. I’m sure the AM will be the next to be gobbled up into a multichannel facility. Keep a few hundred feet for the AM tower, sell off the rest of the land.